This is not a typical episode topic. I was asked by several listeners to share how I manage to do so much. 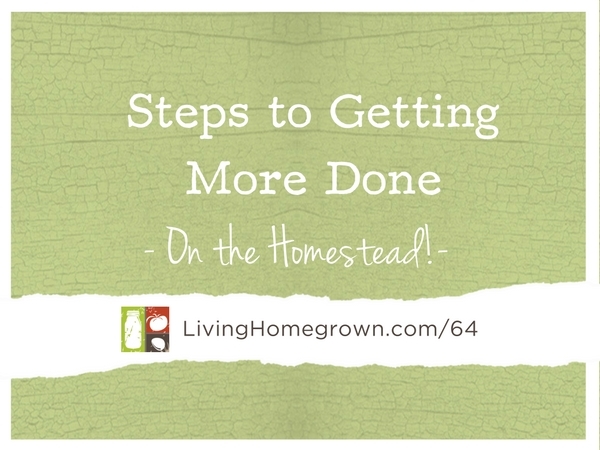 They wanted to know if I would share homesteading tips for managing time, workload and energy levels. Well, I don’t think we can really manage time – because we all have the same amount of time, right? But, we can manage our tasks within that time. Most of us have way too much on our To-Do lists – which can be overwhelming. So this podcast is about creating the proper mindset to keep our energy and motivation up while still working on a farm fresh lifestyle. This is not a topic I usually cover on this podcast, but hopefully a few tips will resonate with you on your own farm fresh journey. There is a worksheet below that you can download to help you follow along. Before listening, I highly recommend you download the PDF to work thru the 7 tips for yourself. There are also additional resources on the PDF. I’m going to see what’s wrong and I will email you the PDF directly. Not sure what the issue is yet. But I’m on it! I’m SOOO glad this resonated with you. I never in a million years would have thought to talk about this unless people had asked. That’s why I am so appreciative of feedback from my listeners. Thanks for your other responses on what you’d like to see covered. I can certainly dive deep in other episodes along this productivity line. I am always tweaking and refining and trying new things myself. I can talk about planning the day, overwhelm, delegating (My family is incredibly helpful around the home – THAT is how I get so much done around here. But that did not happen on its own – it’s a process!) and all sorts of other tips. I will definitely cover this again in the near future. Yes! I’d love to hear more about planning the day, overwhelm and delegating! If you have some secret mojo to get your family to help out around the house, WE NEED TO KNOW THIS!!! ASAP!!! LOL! Okay, I will add this topic to the list. Looking forward to it, as I do all of your episodes!